When theater critic Michael Coveney asked Maggie Smith if he could write her biography, she replied, “Ooh, how absolutely ghastly. How absolutely awful. I can’t think of anything worse.” But the reclusive Smith, one of our greatest living actresses and beloved by a new generation for her work in the “Harry Potter” movies and on the TV show “Downton Abbey,” reluctantly gave Coveney the go-ahead. She did not speak to him much herself, but she let him speak to some of her colleagues, her second husband Beverley Cross, and her two sons, Chris Larkin and Toby Stephens, who are both actors themselves. The result is an authorized look at her career and her life that was first published in 1992 and is now updated to include her current credits. Smith was born in 1934 to a working class family, and her mother was a cold and penny-pinching stickler for propriety. Smith’s brother Ian noted that there was antagonism between mother and daughter but it “never erupted into the open; it just sort of simmered.” Smith saw her first movie in 1946, "The Jolson Story," and her father beat her after he found out she had gone to the cinema. She was a lonely child, but already tart and sarcastic from the sidelines. Because of her background, Smith intimately knows the kind of lower crust English striving for gentility that she explored, in both comic and dramatic ways, in some of her best movie work. Her mother told her that she could never be an actress “with a face like that,” but Smith was not deterred, and as a young girl she had an instinct for mockery. In high school a tutor named Mrs. van Beers gave Smith a speech of Helena’s from "A Midsummer Night’s Dream." “She sent it up!” Mrs. van Beers recalled. “A child of fourteen … she had, even then, marvelous comedy timing, and she never made a mistake.” In her late teen years Smith started working in repertory English theater, and a young actor from this time, Patrick Dromgoole, remembers that Smith was one of the first girls he saw wearing blue jeans; he observed her sitting in them in bath water and “allowing them to dry to shape around her figure.” The rebellious and sensual young Smith loved J.D. Salinger’s novel “The Catcher in the Rye” so much that she wrote Salinger a fan letter. This was before Salinger withdrew from public life, and he actually wrote back to her, but Smith’s mother destroyed Salinger’s letter before her daughter could read it. Smith started to work in TV and film, but her most notable acting in the 1960s was as a member of the National Theatre under the guidance of Laurence Olivier. She played Desdemona to his Othello on stage and stood up to him as best she could, but everyone seems to agree that their best work together was in Ibsen’s "The Master Builder." A reviewer wrote that Smith acted Olivier off the stage in that play, which did not sit well with the great man, for he knew that Smith was the only member of the company who was serious competition for him. Smith blossomed opposite Robert Stephens in a Franco Zeffirelli stage production of "Much Ado About Nothing," and she got a huge laugh with the line, “This haddock is disgusting” in a revival of Noel Coward’s "Hay Fever." Smith also triumphed in difficult Restoration comedy plays like "The Way of the World" and "The Beaux’ Stratagem," and she did a noted Hedda Gabler for Ingmar Bergman in 1970, stressing the interior pressure on this thwarted character and shooting herself at the end in full view on stage. Almost all of Smith’s finest work dramatizes the conflict between her puritan side and her hedonist longings, a very rich vein of opposition that flows directly, and often indirectly, from her own private character. Smith married Robert Stephens in 1967 and had two sons by him, but there was trouble in their marriage once she won the Oscar for “The Prime of Miss Jean Brodie” (1969), where she played a Scottish teacher who inspires her girls (or “gels” in her fancy pronunciation) to both good deeds and bad. Here was a performance that revealed Smith’s full talent on camera, with all of her little trickeries of tone and emphasis, her heartfelt affectations, her mannerisms, which played out on the angular exterior of her face and body to hide rather harsh and mysterious depths of feeling underneath. Smith’s Miss Brodie likes to hold her chin high and keep her eyes half-closed, and her hands and wrists seem to have a snake-charming life of their own. 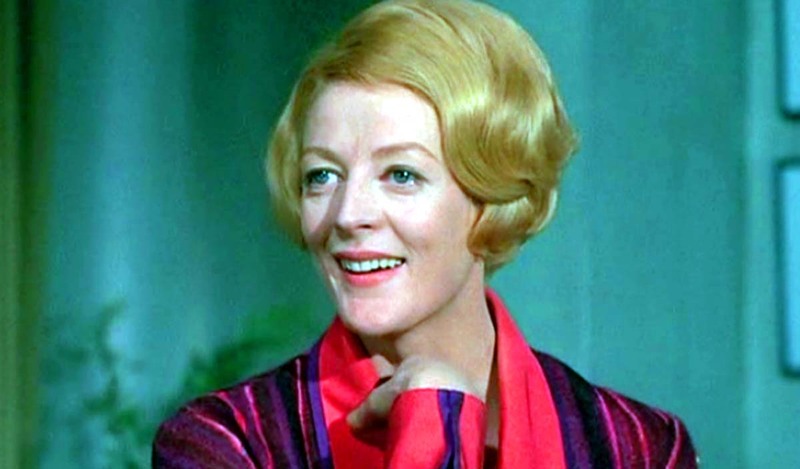 She can do just about anything with her voice, taking it up and down the scale and manipulating words until you are as dizzied by them as Miss Brodie’s pupils are. Every choice Smith makes in “The Prime of Miss Jean Brodie” is impeccable, both decisive and alive with Miss Brodie’s furtive indecision, confident on the surface but deeply troubled and secretly weak within. The catch in this film is that though Miss Brodie is entertainingly colorful and amusing she actually is the corrupting influence on her students that the conservative headmistress Miss Mackay (Celia Johnson) takes her for, an admirer of the fascist Benito Mussolini and the Spanish dictator Francisco Franco, a lover of authority and brute force. 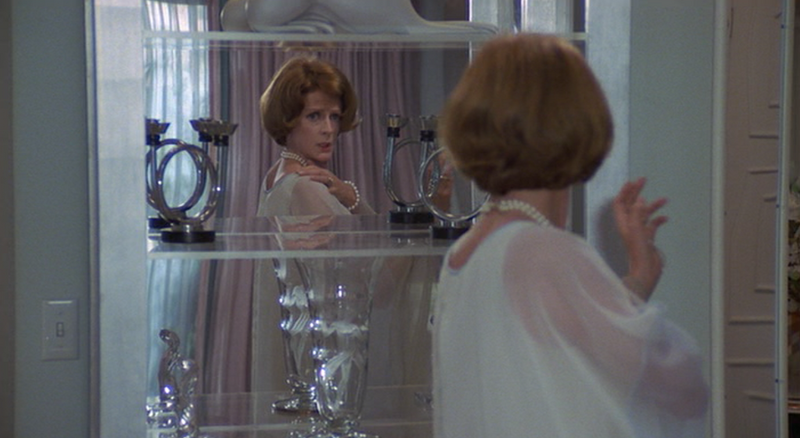 There is an emotional force in Smith in her best screen roles that cannot be easily analyzed or explained. When she wants to, she can summon and focus an emotion in a way that feels like a wide brick wall coming down and then moving forward over both co-stars and camera. This might not be the most camera-friendly work, and there are times on screen as a young woman when Smith seems uncomfortable, as if she is remembering what her mother said to her about not being good-looking enough to be an actress. But as Jean Brodie she gives one of those performances that feels like a full-course meal, detailed, funny, moving, complete, especially in the last confrontation scene with the betraying Sandy (Pamela Martin), in which we see Miss Brodie stripped of her illusions before putting them right back on again. Her husband Robert Stephens, who is in “Jean Brodie” himself, did not get the parts that would have made him a movie star at Smith’s level, and his disappointment in that and his womanizing gradually destroyed their marriage. The early 1970s were not a good time for Smith either personally or professionally. Both on stage and on screen in this period she began to overdo her comic mannerisms, but after she divorced Stephens in 1974 she did four seasons at Stratford in Ontario where she took on most of the major Shakespeare roles and pared down her acting style for maximum effect. It was a time of renewal for her, and of marshaling her strength and her talent. Smith won a second Oscar for Best Supporting Actress in the Neil Simon adaptation “California Suite” (1978), but this film was not a happy experience for her. “I thought you were supposed to be funny,” director Herbert Ross told her, and he berated her so often on set that she was reduced to tears. The Simon material is far from Restoration comedy, but Smith and Michael Caine make something stylish and touching out of it anyway, working over and against their wisecracking one-liners. I can watch the Smith/Caine scenes in “California Suite” pretty much any time (Bill Murray is also a vocal fan of them) because Smith in particular turns every single one of her sow’s ear lines into a silk purse by acting as if they were very witty and amusing. Smith did some of her best filmed work in the 1980s, particularly in two scripts by Alan Bennett, “A Private Function” (1984), where she played a genteel Lady Macbeth-type housewife, and the monologue “Bed Among the Lentils,” which was done for TV in 1988. If you want to see great acting with no fuss and deadly accuracy look no further than Smith doing this 50-minute Bennett monologue about the alcoholic wife of a vicar who finds sexual fulfillment with a much younger grocer. Smith seethes with controlled rage and irony throughout “Bed Among the Lentils,” keeping such a tight hold on her effects that you can barely breathe while you watch them. She has a similar impact in “The Lonely Passion of Judith Hearne” (1987), a character study about an alcoholic piano teacher whose small hopes are getting smaller all the time. Smith’s Judith Hearne is the artistic height of her screen work, a performance so concentrated and unsparing that it leaves nothing but scorched earth in its path, particularly in the scene where we first see her Judith taking a secret drink after one of her worst disappointments, and in a follow-up scene where Smith cries, “Me spirits!” in her most centered, annihilating, and forceful voice when the clumsy Bernie (Ian McNeice) accidentally knocks over her bottle of whiskey. Smith uses that same brick wall tone when a drunken Judith goes to church and kneels and screams, “I hate you!” at the altar, one of the most painful scenes in all cinema. But there are some recent films, here and there, that have taken advantage of her full skill set, like the TV movie “My House in Umbria” (2003), where she played Mrs. Delahunty, a drunken romance novelist, and “The Lady in the Van” (2015), another Alan Bennett story that will be opening in the US in January. Smith played in “The Lady in the Van” on stage in 1999, and so she is working from a firm base in the movie version. As Miss Shepherd, an itinerant lady who actually took up residence in Bennett’s driveway for fifteen years, Smith lets us see that this woman lives in a world of her own; she is a totally powerless person who survives by believing herself to be busy and powerful. When Bennett (Alex Jennings) at one point asks her for an apology, Smith’s Miss Shepherd replies, “Sorry is for God.” That’s an archetypal Maggie Smith line, and “The Lady in the Van” is a welcome addition to her gallery of snobby, ruined eccentrics. Surely there are crucial things about her and about the way she works as an actress that are not here, particularly in regard to her embattled marriage to Stephens and how it affected her professional life. But for now it is the best resource we have on one of our most distinctive actresses, a caustic observer of life, a scathing presence and intelligence, and an artist who is capable of the highest level of invention. Click here to purchase "Maggie Smith: A Biography"